Fragile Protection: This versatile storage rack can hold a variety of glasses and is great for entertaining. 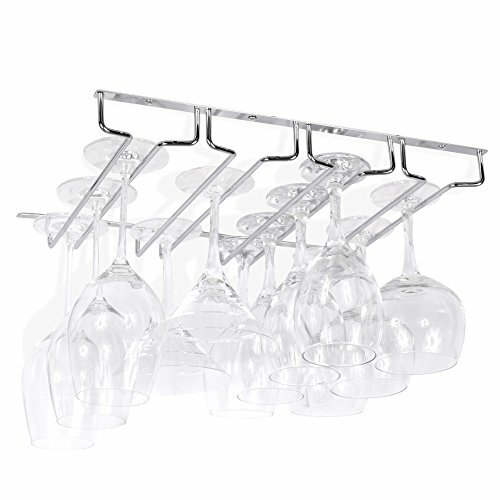 Store and protect your delicate wine glasses, champagne flutes and other glassware with this hanging stemware rack. Bring new function to your existing cabinets and storage. Add Flair and Style: You can mount each of these racks under any credenza, hutch, buffet, shelving unit or use it traditionally under your kitchen cabinets. Create a practical DIY bar storage unit and conserve space with style. Stylish Contemporary Design: These racks look great with a variety of cabinet styles and finishes. Provides simple accessory to help you organize your glassware for clutter-free, convenient storage. Fits underneath almost any cabinet and you can combine multiple racks for additional storage. when enjoying the beverage of your choice this rack will keep all your favorite glasses organized and ready for quick access. Simple to Install: This under cabinet stem rack come fully assembled and ready to mount to help you conserve space in your kitchen. The rack hangs 1 ¼" below the cabinet sizing 17" long and 13.5" deep. You can store up to 12 stemmed glasses with ease. Functional and Elegant: Made of sturdy steel and polished chrome this stemware rack adds a touch of elegance to your kitchen or bar décor. With durable construction, the rack is easy to clean and will last a lifetime. Storage and Organization: Install as many racks as you need underneath the cabinets in your kitchen, or anywhere you want. Your stemware will accent your existing cabinetry in this convenient storage unit. Holds Up to 12 Glasses: This rack looks great and keeps your stemware ready to go for impromptu gatherings. Depending on the style of the glassware, you can store up to 12 glasses with a base up to 3 ½ inches. Get More for Your Buck: With 4 rows you will have enough room to store all your glassware for entertaining, but should you need more space you can install multiple units side by side for additional storage and do it all for an affordable cost without hurting the bank account.